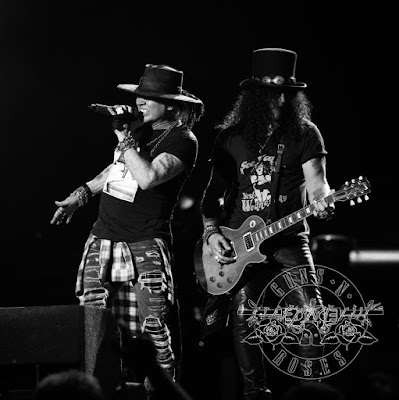 Guns N’ Roses performed rare covers of classic tracks by Glen Campbell and James Brown during their August 30 date at Commonwealth Stadium in Edmonton, AB, and video from the show has surfaced online. "We're going to play something we've never played before," Axl Rose told the crowd about halfway through the evening. “It might not be your thing, but we're just trying to pay a tribute to someone. It's not what you think," before the group delivered a faithful version of Campbell's 1968 hit, "Wichita Lineman." "For Glen," added Rose after finishing the tune by the legendary country musician, who passed away on August 8 at the age of 81 after a lengthy battle with Alzheimer’s disease. “What a night...Thank you Edmonton!,” posted the band on social media after the show. The Edmonton stop marks one of the final dates of the group’s North American summer tour, which will wrap up in San Antonio, TX on September 8. The band will enjoy a month-long break before returning to live action for fall dates on the continent starting October 8 in Philadelphia, PA.